Bless my mother’s heart because she’d never been to New York City. This past Christmas, we decided to surprise Momma with a trip to NYC. Since I had a limited amount of vacation days, we decided to maximize this trip as best we could. We left on Friday around lunchtime and came back early Monday afternoon so I could still get a few hours of work done on both Friday and Monday. This wasn’t my first rodeo with The Big Apple so I had a pretty good idea of what all we could accomplish with just a few days in Manhattan. It also helps to have pals/former Southerners in New York – special thanks Katie Cooper, Liz Krebs, and Cody Williams who helped with planning and suggestions! Below is my agenda and tips. This 3 days in NYC agenda works well if you’re planning to do a long weekend in the city, especially for tourists who have never visited. Here’s how to spend three days in New York City. 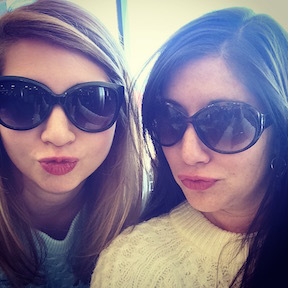 Because Southern Sisters do #duckface in NYC! We left from Atlanta and flew in LaGuardia (LGA). I reserved a town car via Blacklane so we had a luxury ride waiting for us upon arrival. If you’ve never used Blacklane, it’s like Uber but it takes reservations and you know your exact fare. We got into Manhattan pretty quickly (the airport is in Queens) and our Blacklane driver said we were the nicest passengers he ever had, but goodness he probably doesn’t have three Southern ladies in his car very often! We stayed at The Affinia Shelburne which was in a stellar Midtown location at Lexington & 37th just down the block from Grand Central Station. They offer free wine every day from 5 to 6 p.m. The restaurant, Rare, is pretty good and open for breakfast, lunch and dinner. That evening we had dinner at Dos Caminos (make a reservation) which offered some of the best margaritas in Manhattan. Yelp said to check in to get a free prickly pear shot, which I did and our server gave us shots for the whole table. Breakfast at the hotel. For coffee, orange juice, two pastries, a side of bacon, and a bowl of fruit, we paid $40 for breakfast. It was delicious but expensive. We hopped in a cab and drove from Midtown to the Financial district. You pass some great landmarks in the route down 5th Avenue including the Empire State Building and the Flatiron building. For brunch: Sarabeth’s in TriBeCa. This was a great spot for omelets, mimosas, Bloody Mary’s, and other brunch fare. We even got to meet up with my pal Shane and have lunch with his momma and sister also visitng from the South. 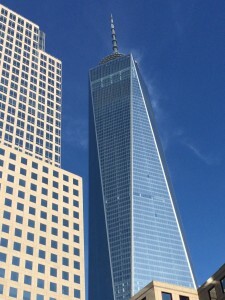 From there we walked down to One World Trade Center. The 9/11 Memorial Fountain is truly a sight to behold. All of the names of the victims are engraved in the marble. 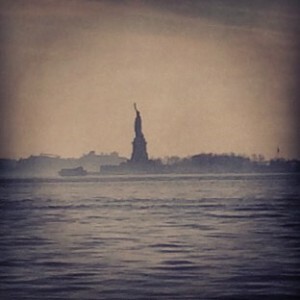 Speaking of sights, there’s a great vantage point of The Statue of Liberty just block away. Instead of hiking it all the way down to Battery Park, we went to Battery City Park and looked across the river at Lady Liberty. It was about 1:30 when we hopped in a taxi back to Midtown where we were dropped off near Central Park (ask for a taxi to 59th & 5th). We did a bit of window shopping on 5th Avenue, and stopped by Rockefeller Plaza to see the tree. Next up it was the Radio City Christmas Spectacular. 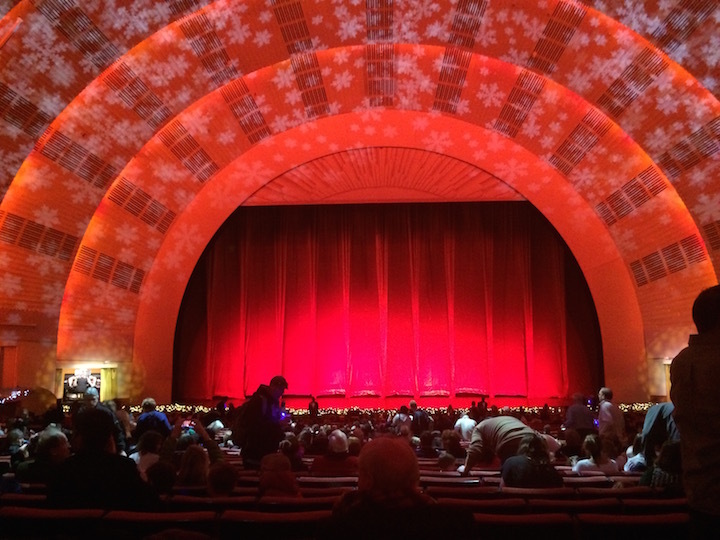 Radio City at Christmas is truly spectacular! Which signatures from celebs do you see? That evening we had dinner at Keens Steakhouse. I made our 8 p.m. reservation a few weeks in advance to ensure we got a good table. My goodness y’all, the hospitality was on point! Keens is definitely one of the top 10 steakhouses in Manhattan. Special thanks to the manager, Ronnie, for taking the time to treat us like VIPs and show us a bit of the history. One of the artifacts on the second floor includes the playbill President Lincoln was holding when he was assassinated! Apparently the original owner had a huge passion for history. 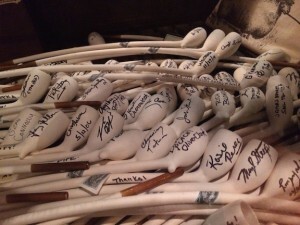 To this day, every celebrity who dines at Keens signs his/her autograph on a clay pipe. 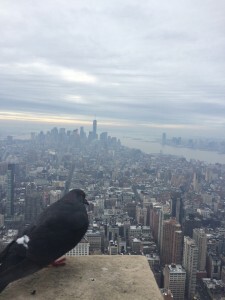 Here’s our bird’s eye view from the Empire State Building. We grabbed breakfast at the hotel before walking a few blocks up to the Empire State Building. We bought our tickets in advance for the 86th and 102nd observatory decks, as this way we were able to cut the lines. Also, going on a day when the weather is overcast helps cut down the wait time. The day before it was sunny and the guides said the wait time was three hours! 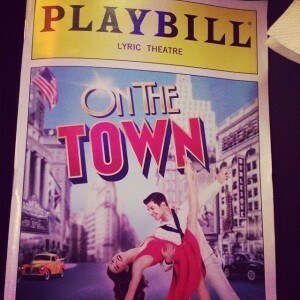 Our neighbor from growing up & Pebblebrook High School grad, the amazingly talented Cody Williams is currently in “On the Town” at The Lyric Theatre. This show is a perfect example of everything great about Broadway. After the show, we walked across Times Square to The Marriott for drinks at The View. This rotating restaurant offers a 360-degree view of New York City, and it was a great way to end our last night. The drinks are pricey and the food didn’t look great so we grabbed dinner at Docks Oyster Bar near our hotel. We went to bed early because our flight the next morning was at 11 a.m.
Read TripAdvisor for the most trustworthy reviews on what you’ll be getting from your hotel stay. Make reservations for brunch, lunch and dinner. I use Yelp a lot and mapped restaurants within walking distance to our hotel and activities. Bite the bullet on the price and stay in Midtown Manhattan. It’s much easier instead of commuting into the city from a hotel in Newark. To save a bit of money on meals, instead of eating breakfast at the hotel, eat like the locals. The bagel place around the corner is probably decent, and there are Starbucks practically on every block. It beats paying $40 for a continental breakfast. What would you do if you only had three days to spend in New York City? 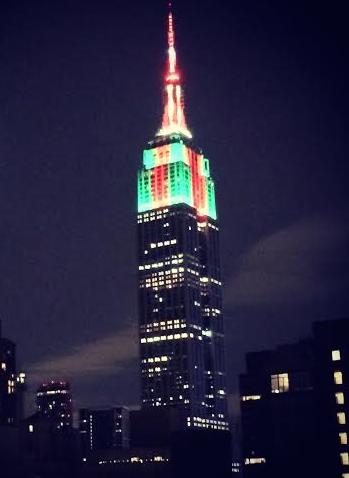 I was just in NYC, too! We spent NYE there and had so much fun! These are really good tips, and we definitely used Trip Adviser when we were wondering the city by ourselves without our friends that we were staying with. 🙂 It sounds like you had a great time!! I was born in NY, so anytime I visit my trips consist of visiting family members 99% of the time. I love that you were able to experience so much from the city! That seems like such a marvelous trip. Do you think you’ll be making another trip up there soon?